A 20 litre bright pink microwave, with chrome controls, providing 700w of power and a digital display. Very pink! 700w of power, definitely stands out. Depends on whether you like the colour pink. Not a named brand either. 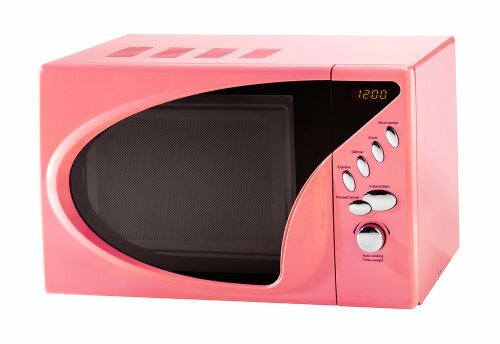 Looking for a bright pink microwave? This pink and chrome digital microwave may just tick that box. Offering a 20 litre capacity, and 700w of power, this solo microwave provides a host of features for it's price tag. The LED display is clear and easy to read, and the chrome controls simple to operate. The turntable is 27cm in diameter, and removable for easy cleaning. On the downside, we are unsure of the exact manufacturer of this microwave - it isn't clearly labelled - it's generic. However it will come with a guarantee should you encounter any issues. The main reason for buying this microwave is the pink colour scheme - there are not many pink microwaves on the market, and so if this is what you require, then your options are slightly limited. As such, this appliance is ideal for those with a bright pink colour scheme in their kitchen. Overall dimensions are 46cm by 31cm by 28 cm, and weight is around the 15kg mark. This generic pink microwave isn't from a named brand - however this doesn't necessarily means it's a bad choice. It is also very pink, so obviously only buy this model if you love the colour scheme. Not bad value, and decent power. Stylish Pink and Chrome Digital Solo Microwave.